Since 1946, we have designed and manufactured engineered knitted wire mesh solutions for applications in virtually every industry. From our industry-leading R&D Department to the world’s largest vertically integrated manufacturing process, we have the capability and capacity meet our customers’ demands. 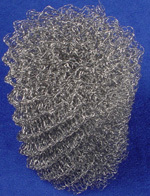 Please find some selected examples of industrial applications for our Knitted Mesh below. Our Calendar Mesh and Mesh-Core cable are used primarily in high-temperature or cryogenic seals and gaskets. We designed our Calendared Mesh and Mesh-Core Cable to flourish in difficult operating environments where other materials cannot. During the design phase, we choose wire types specifically for their resistance to certain destructive elements. This increases the resistance of Calendared Mesh and Mesh Core Cable to temperature extremes, corrosion and otherwise destructive elements. Additionally, the spring composition of Knitted Wire Mesh gives it an inherent resistance to mechanical wear. We designed our Knitted Wire Mesh Breathers and Filters for operating environments where other media fail. We specifically choose wire types for their resistance to extreme temperatures and corrosives. This is done in order to meet a wide range of filtration or flow targets. Since all of our tool design and construction is done in-house, we can engineer each Breather or Filter to fit any dimension requirements at the shortest possible lead times.